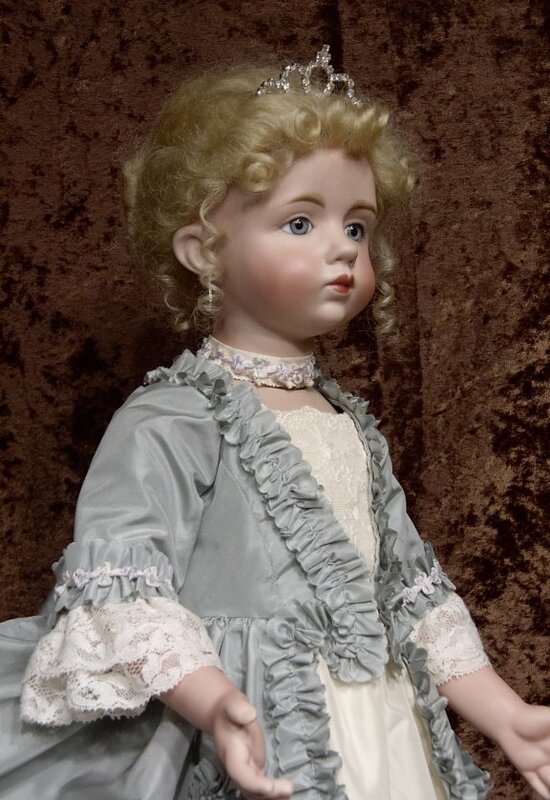 A.Marque dolls are some of the rarest and most sought-after dolls in the doll collecting world. 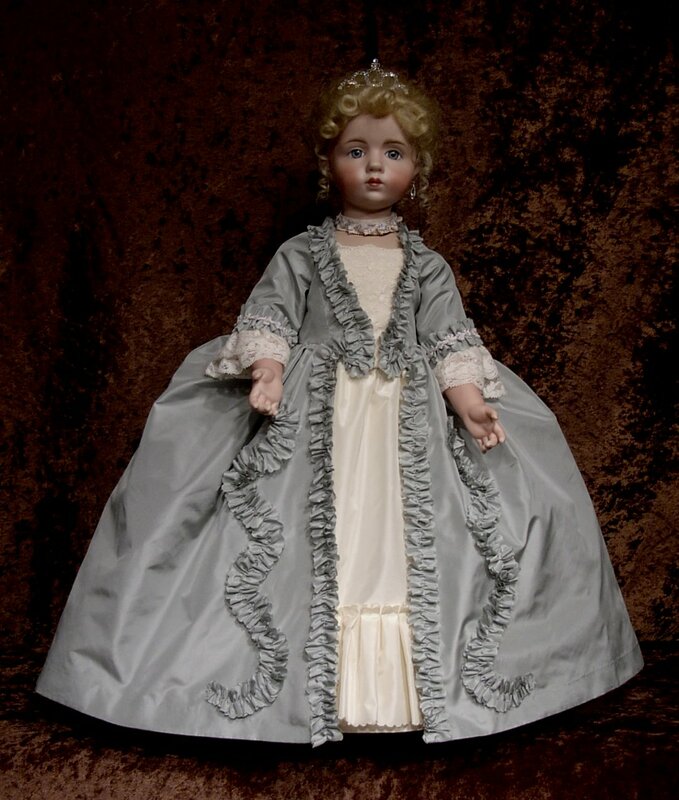 They were made for a short period in Paris--around 1915--and it is thought that only 100 of these dolls were made. 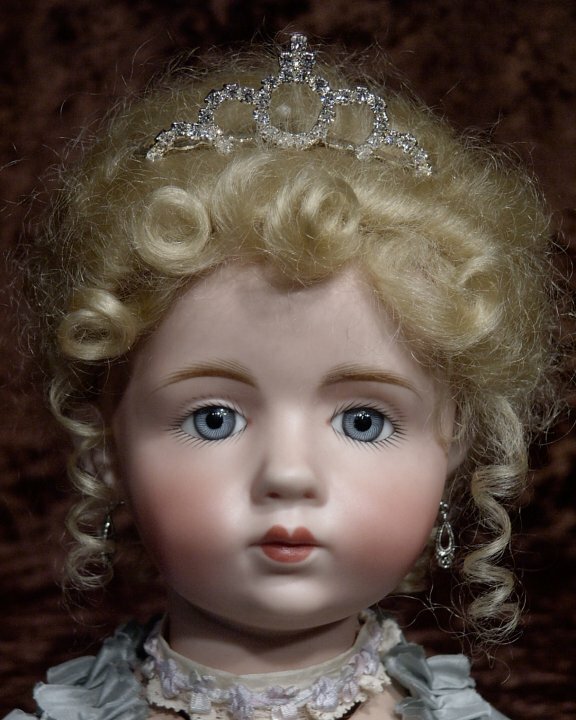 Today, because of rarity and desirability, an A.Marque doll can sell at auction for around $150,000 to 200,000. 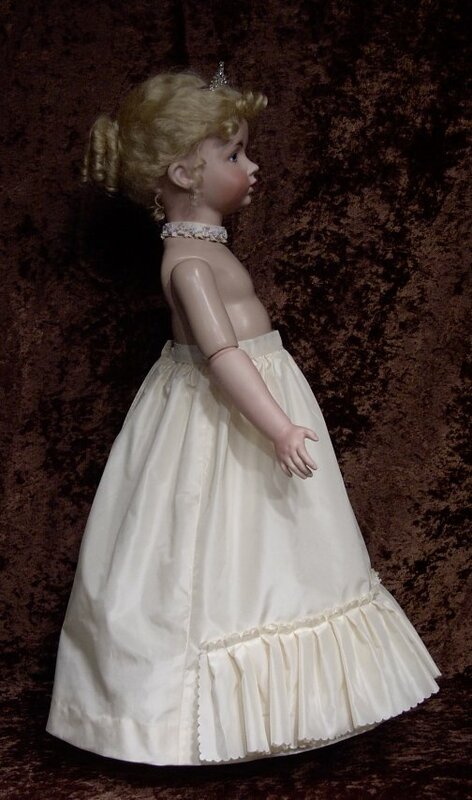 Five of these lovely dolls are part of the collection of the Carnegie Museum of Natural History in Pittsburgh. These five dolls were dressed in 1915 by Madame Margaine Lacroix as famous French queens. The queens depicted were Queen Isabeau of Bavaria (1371-1438, wife of Charles VI), Queen Marie Leszcynska (1715-1774, wife of Louis XV), Queen Marie Antoinette (1755-1793, wife of Louis XVI), Empress Josephine (1763-1814, wife of Napoleon I), and Empress Eugenie (1826-1920, wife of Napoleon III). 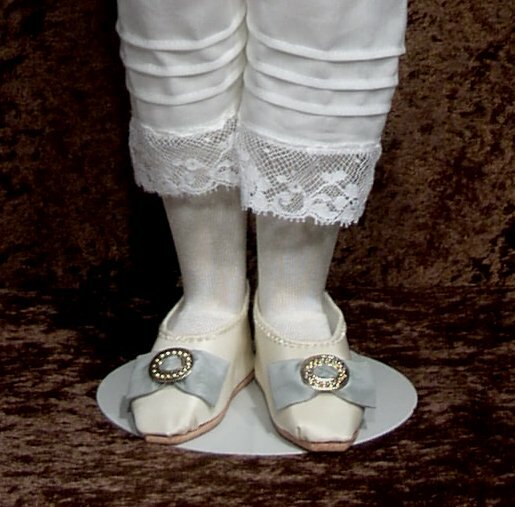 In 2000, two dollmakers in Europe contacted the Carnegie Museum, requesting information on these dolls. With that information, they created their own interpretations of these French queens. 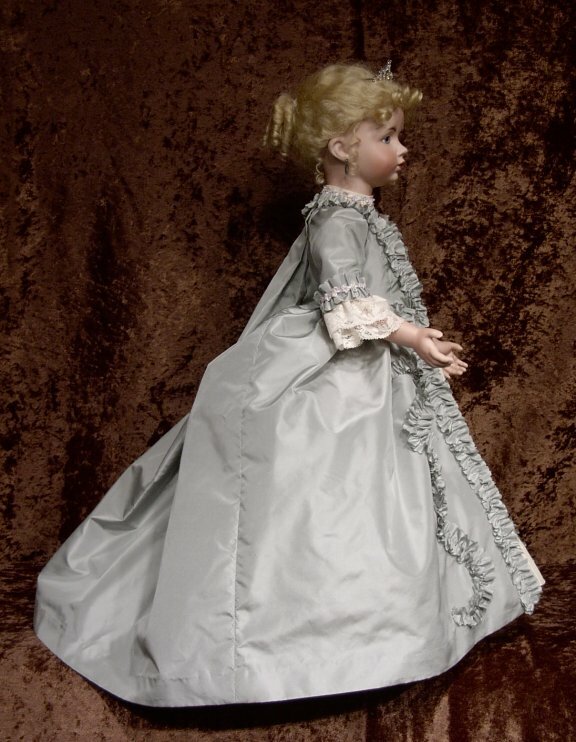 The dolls, which won numerous awards at the European Interdoll 2002 competition, were lovely! The dollmakers eventually provided patterns, which can be purchased through Gildebrief, the magazine associated with the competition (www. gildebrief.de). A friend of mine had seen photographs of original A.Marque dolls. She loved their unusual look and asked me to make a reproduction one for her. She thought the idea of an A.Marque costumed as a French queen was very intriguing. I sent her photos of the five queens and suggested she choose the one she liked. She and her husband were immediately drawn to Marie Leszcynska because they appreciated the art works of Fragonard, Watteau and Boucher. Marie's costume, from the mid-1700's, made them think of these art works, so the choice was made! Here's a close-up of the A.Marque queen. The A. Marque doll was painted by me. She has blue-gray paperweight eyes. Her tiara was purchased in the bridal area at a craft store. Her earrings are silver-toned. She wears a restyled mohair wig. Around her neck is a simple ivory taffeta band that's been covered with "buds and bows" silk trim. The same trim has been used around the sleeves of the dress. Here's her lovely gown. I have significantly altered the Gildebrief pattern in the front closure...there is now a built-in corset in the overdress. I also changed how the gown was pleated in the back. I used lace trim on the bottom of the sleeves and made self-fabric trim around the front edges of the overdress. To make the trim, I used scalloping shears to cut a scalloped edging on 1-1/4" bias strips. I then lightly gathered the strips, sewing them to the overdress. My friend had some lovely vintage silk in an unusual gray-blue color. The material was such an inspiration! The overdress is lined in a matching gray china silk. The white silk v-shaped piece on the bodice is covered with an all-over lace pattern. Under the overdress is the first skirt or petticoat (picture one and two). It is made of a light ivory silk taffeta. It, too, has a ruffle made with a scalloped edge at the top and bottom. It was pleated and then sewn to the bottom of the skirt. Following the style of the time, the ruffle on the underskirt is only on the front of the skirt. 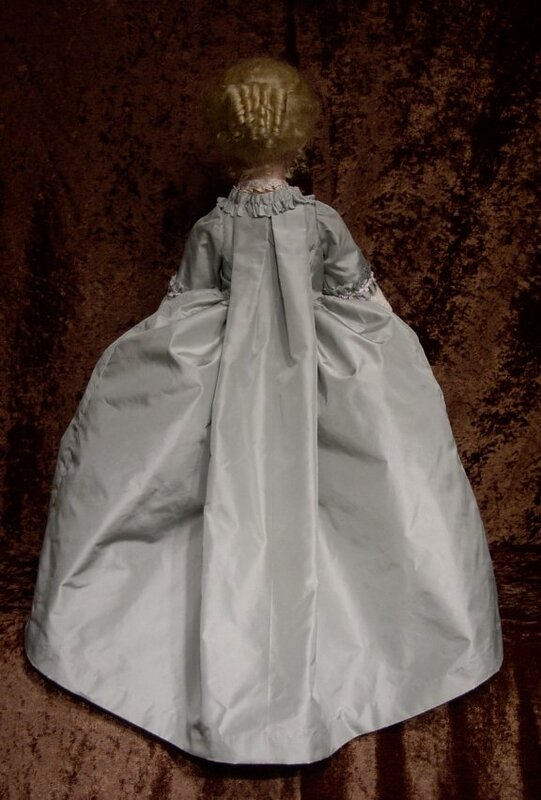 Since the overdress covered the back of the underskirt, extending the ruffle to the back of the underskirt was considered unnecessary and wasteful. The third photo shows a second petticoat--a simple cotton one, trimmed with lace. And the last photo shows detail on her drawers, silk stockings and silk taffeta shoes. Hope you enjoyed the photos and a small history lesson! She's a lovely doll and was a joy to create!